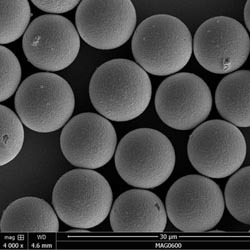 Conductive microspheres are usually achieved by applying a silver metal coating on hollow or solid glass microspheres. Electrically conductive microspheres are often used as a conductive filler that is lighter than solid silver in paints, adhesives and composites to provide electrical conductivity. They are also used as catalysts, laser fusion targets, and electrically conducting bond line spacers in advanced electronics and other applications. The low particle density and large surface area facilitates slow phase separation in paints and adhesives compared to heavy metallic and inorganic fillers. Conductive silver-coated microspheres are widely used in many industries due to the combined benefit of precise dimensions and electrically-conductive properties. Typically at 20% loading micropspheres can create effective shielding against electromagnetic interference (EMI). Conductive silver coated microspheres are available in a large selection of particle sizes and densities.